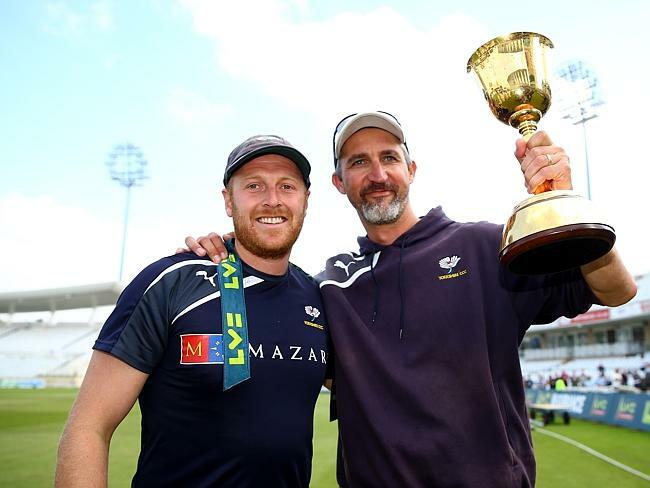 So tomorrow marks the last day at Yorkshire County Cricket Club for Jason Gillespie. And what a ride it has been. The man known as Dizzy will go off to coach the Adelaide Strikers, swapping Ilkley Moor for the Barossa Valley. Gillespie has been nothing short of sensational during his time in Leeds. His track record is truly remarkable and there will be a tear in the hardened eye of many a Yorkshire fan when this genial South Australian departs. Let's get this straight - I'm a Middlesex fan. I want the County Championship to come to London but if Yorkshire win at Lord's tomorrow, part of me will be pleased for Dizzy. At Lord's yesterday I spoke to a few Yorkshire members. They are gutted. One trait Australians and Yorkshire folk have in common is that cussed hardness, never giving up and having plenty of, (to use an Australianism), 'dogfuck'. That ran through his team yesterday, with three of the top four being out for nought, his side still ended up getting nearly 400. That is showing some serious ticker. Like another Australian in Darren Lehmann, Gillespie's place in Tyke folklore is for evermore. I was lucky enough to interview him a few years back. He speaks extremely well. I listened to him commentating on the BBC Radio Yorkshire commentary of Yorkshire v Middlesex earlier in the year and besides ripping the living daylights out of the commentator 'Cally', for his pronunciation of the Middlesex player Stevie Eskinazi and making him sound like Echinacea, Gillespie spoke clearly, simply and concisely. You can see why he makes an outstanding coach as he delivers his message with clarity and gets his point across quickly. He encourages his players to think on their feet and he trusts them. In the interview he gave me a few years ago, he told me that he puts his faith in his training methods and if his players train hard enough then they are ready to go out there and do the business. His track record suggests that works, considering you can count the amount of four day games that he has lost on your fingers. Gillespie is a man of principle. A committed vegan, he was described as 'the Morrissey of cricket' by one wag but in these days of certain cricketing people pandering to sponsors needs, it is a refreshing outlook. Yorkshire are sponsored by a dairy company and he disagrees with their methods. Gillespie has even spoken about leather cricket balls too. Slaughterhouses and the meat industry? Yep, he's covered it. Gillespie doesn't mince (pardon the pun) his words and that is why he is a legend in Leeds. They like that up there. Dizzy did inherit some good players. Joe Root, Jonny Bairstow, Adam Lyth and a thriving production line were in place but some tinkering made them into the best side in the country. The import of Jack Brooks from Northamptonshire was key as well as Liam Plunkett, whose career was going nowhere until Gillespie took him from the wilderness of the Durham second eleven. Plunkett is now an integral part of the England side in the shorter format. I would love to see him coach England one day. The man who is a self confessed cricket badger, who watches Yorkshire all day then goes home and watches a match on television, would be an outstanding acquisition for the national side. Personally, I feel he will get the Aussie job first. Three in row for Dizzy and Galey Lad? The County Championship will be a poorer place without Jason. Yorkshire have a big gap to fill when he goes but so does English cricket. He has been an outstanding ambassador for the game in this country. Will he make it three in a row? We'll know tomorrow. Let's raise a glass and be pleased to have had the privilege of having him here. Naturally, a glass of his very own Dizzy 201, named after his final Test score. Thank you for the memories, Jason. He is quitting Yorkshire for the only thing that is more important. Family.